This is my running blog to share my running experiences and my love for running with the world. Sunday 19 February it was time again for the yearly Pirates Half Marathon which is known as Johannesburg's toughest half marathon. I've never done this race before and the Wednesday before the race I decided I am going to enter. This was also the last day for online entries. 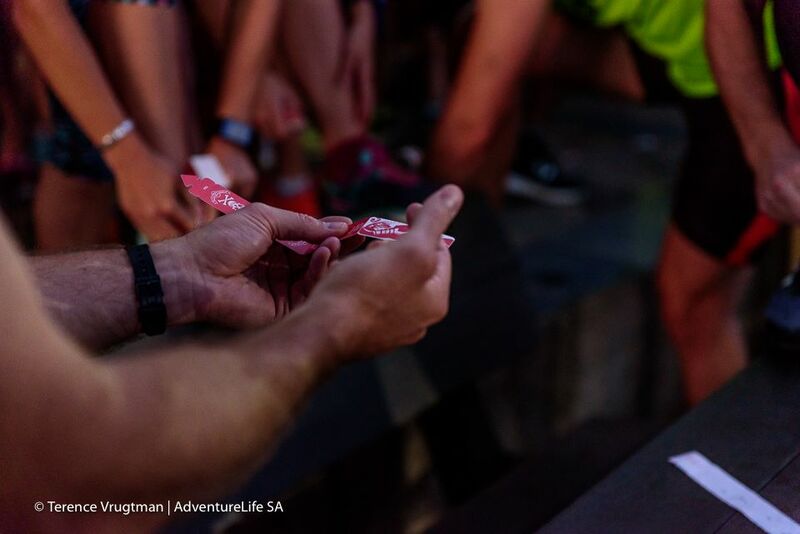 I collected my race number on the Saturday before the race and I was quite surprised that it was only a timing chip/paper that you had to put in your shoe laces and that no race numbers were issued. However, you had to go in on a certain website (instructions as per the below picture) to enter your details according to your chip number so that your details are linked with the chip. I don't think many runners knew that because when the final results were released there were a lot of "unknown" results. Then we gathered at the start in the main street at the Pirates Club. 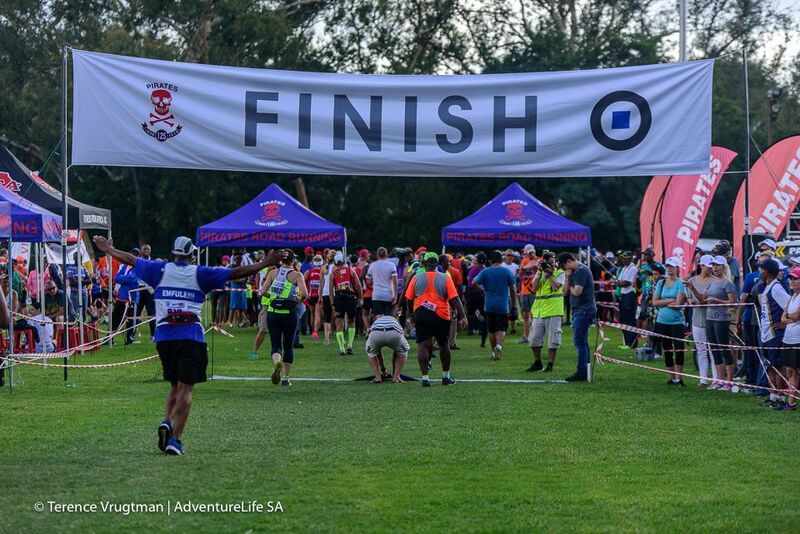 It was a large race with around 4000 entries. I heard afterwards the hosting club were not quite prepared for the large number of on-the-day entries and apparently they ran out of timing chips. This however is unverified. The race started about ten minutes late, but this was probably due to the late entries issue. The race start off with a short straight section then a downhill up to around the 1km mark. Then you start climbing the first of 3 hills. This first hill, the smallest of the three, is around 2 km' s long with an ascent of almost 100m. It has got a sneaky bit in the middle where you think you've reached the top and it flattens out a bit, just to realise there are still another 600m or so to go before the top. The next section of the race is downhill to around the 5km mark with a small bump that takes you to the 6 km from where you start climbing all the way up to the 10 km mark with the most difficult section between the 9 km and 10 km markers where it was just impossible (for me) to run. This was also my slowest km of the race at 10:24 per km. 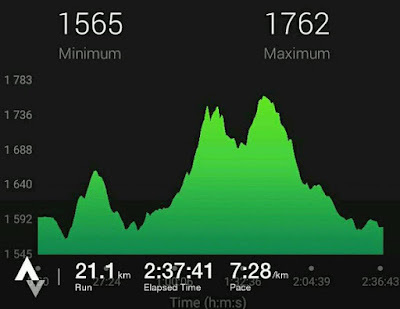 After this mean hill there is a bit of relief with a downhill where you can catch your breath before the final climb starts at around 12.5 km and lasts for around a kilometre which will take you to the highest point in the race at around 13.5 km. 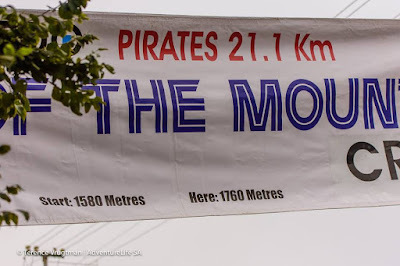 This is also the point where "King and Queen of the Mountain" are determined and when you get to the top there is a lot of support and encouragement from the supporters and people that live in the area. 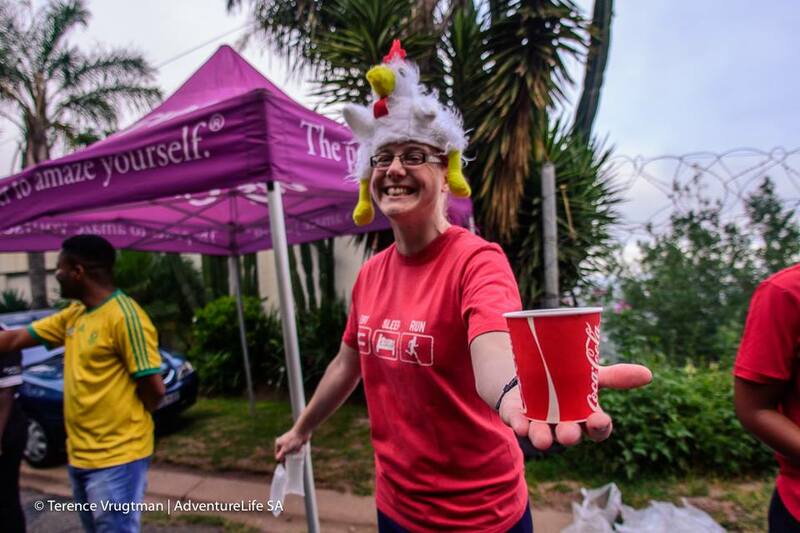 There's also a much deserved water point with ice cold Coke which is welcomed at that point in the race. 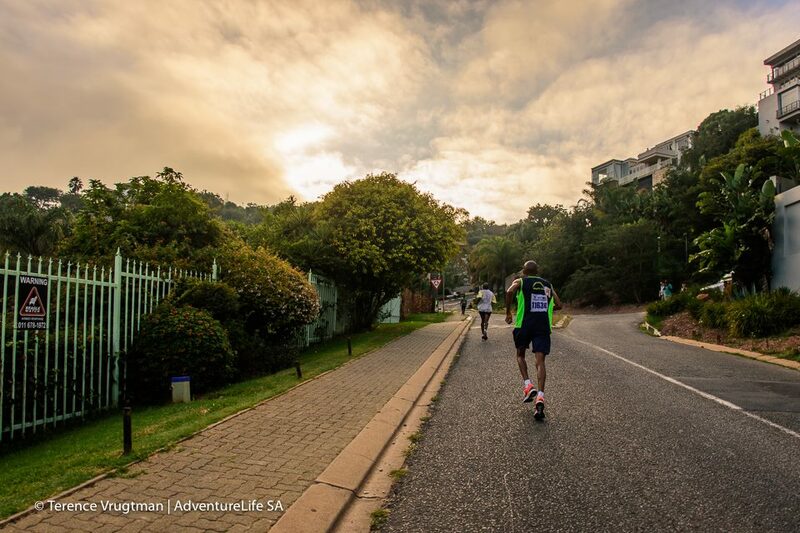 From there it is mostly downhill to the finish except for a few small inclines which can be tough on tired legs. The marshals did a really good job as well as JMPD which was present at most of the large intersections and I am not aware of any incidents with impatient taxi drivers as per my previous post. There's also a long straight section which was also challenging for me as you need to work all the way on these straight sections. When you hit the 20km mark there is a small hill that lasts only for around 400 meters but I remembered at this point I was really tired and just wanted to finish and I ran one lamp post and walked between the next until I reached the grass section just before you turned onto the field at the club where the below sight awaited you. I finished the race in a time of 2:37:41 which is slow at an average pace of 7:28 per km. I expected this and never really expected a PB, but it was really tough and I struggled towards the end, even on the descents. I am very happy with the medal with the very accurate description of "Over the Mountain" on it. 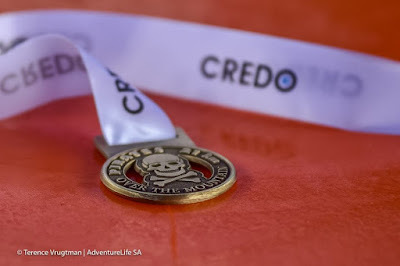 And the skull on it - well it depends how you want to interpret this - It is the sign of the Pirates road running club and it can also mean what will happen to you if you do this race. Overall a very good well organised race which I enjoyed and I will definitely be back. 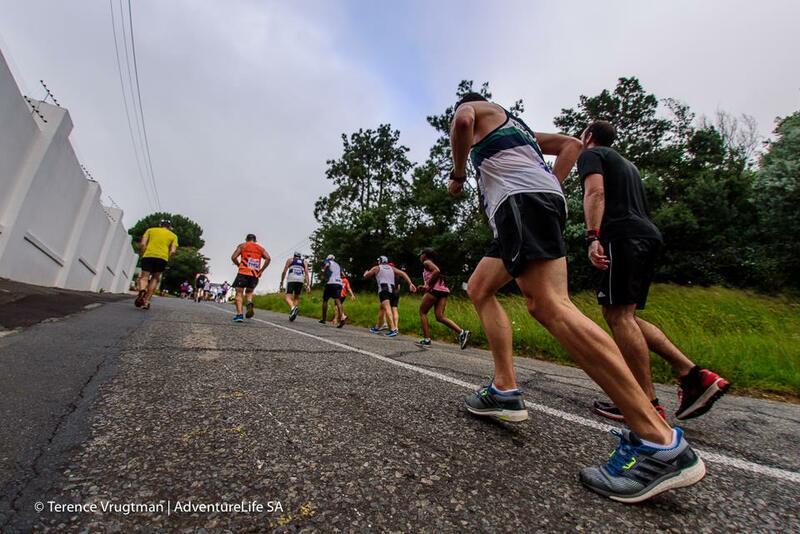 It surely tests your fitness and your mental strength but the views from the top of Northcliff hill is really worth the suffering. 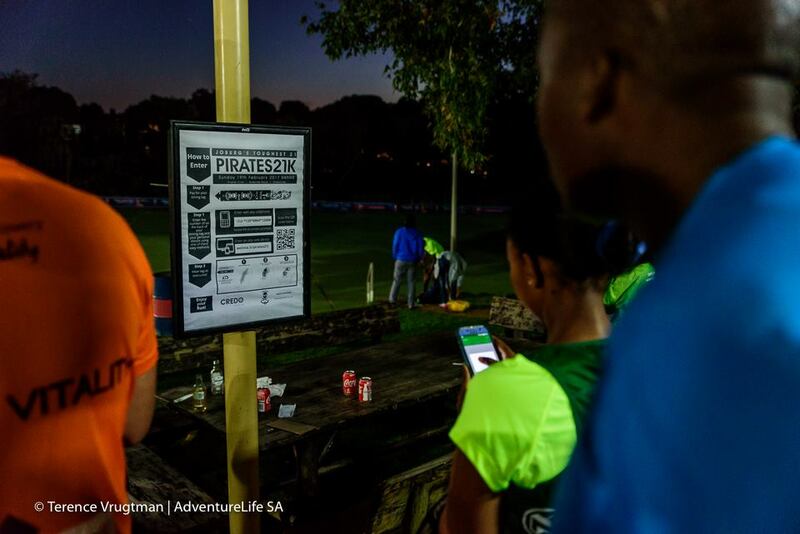 I generally don't run with my phone to take pics during a race but I have found all of these excellent images from Terence "ActionMan" Vrugtman on the Pirates Facebook page. All credit goes to him as he is also a runner and a trail runner who normally runs the entire race that he is photographing. Labels: half marathon, hills, Johannesburg toughest half, Northcliff hill, Pirates Half Marathon, Pirates Running Club, race report, Terence Vrugtman. Last week Friday night was our running club's annual Valentines Night Race as mentioned in my first post. As members of the club, it is generally expected from us to be helping on the night and not to be running this race and my name was up to assist at the finish area. I arrived at the club at around 15:00 last week Friday afternoon and jumped right in and showed the guys that brought the mobile toilets and the water sachets where to drop it off on the route at the two water points. Just got back to the club after that and got a call from one of the club committee members that was in charge of the marshals on route. She said one of the people can't make it anymore and she needs my help at one of the busy intersections. 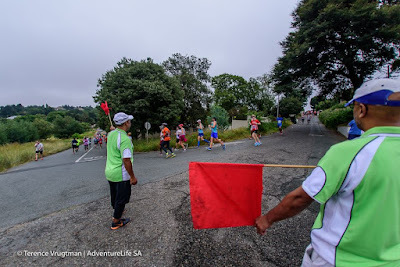 I have done marshalling duty before during a previous race and I enjoyed it - encouraging the people and getting "thanks marshal" comments from the runners. However, this time I decided that I would rather help at the finish to do some other duties and help at other areas and to get to know my fellow club members a bit better, none of which you can do when you're alone at in intersection on a race. 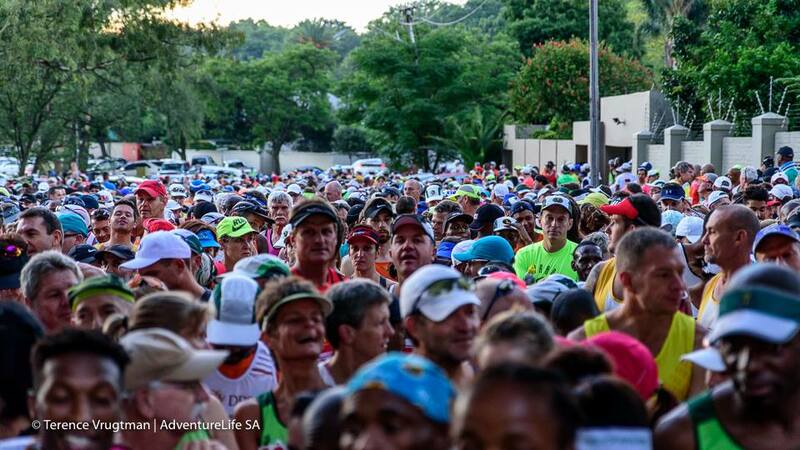 I told the person that called me, let me just check if they need me at the finish and if not, I will assist. She also assured me that although it is a busy intersection that there will be another person assisting me as well as JMPD (Joburg Metro Police Department). So I checked with the people at the finish if they have enough hands and I got back to the person telling her I am available to assist. So I got my reflective bib and my flag and head off to my intersection. It was quiet and there was nobody else at that stage as it was around 30 minutes before the race started. This specific interchange was around 7.5 km's into the race on a tough uphill pull on the famous Maria Drive and about 2.5km's from the end. Just before the race started at 19:00 our Club captain drove the route and checked that all Marshals were at their positions. When he arrived at my intersection there were still no sign of the second person assisting me or JMPD. We quickly phoned the person that was supposed to assist me there but he didn't answer his phone and we left a message for him to urgently get hold of us. The Club Captain said I should be OK on my own and drove off. After around 20 minutes the first runners came past and the road was not too busy. But from 30 minutes to around an hour into the race, it was really busy. 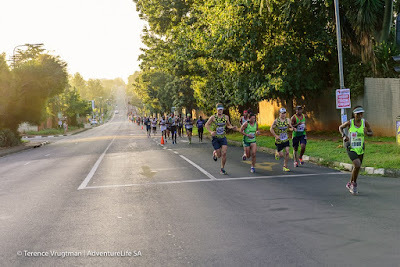 The runners also ran on the entire width of the road, and not just in one lane as there were almost 4000 runners in this race. During this busy time, the intersection also got very busy and there were at one stage 5 or 6 cars on the one side of the intersection waiting to cross the road in which the runners were running. Some cars turned around and tried to take other routes to where they wanted to be and I encouraged some of the cars to do that as well, but some mentioned to me that this was the only route out and they had to pass through that intersection. 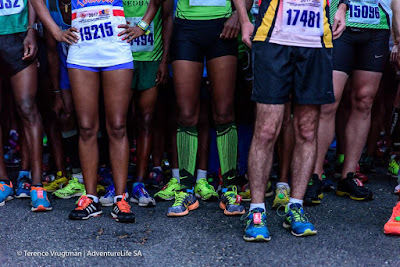 Part of those 5-6 cars was also a minibus taxi that got very impatient and the driver at one stage got out and said I need to stop the runners so he can cross. I said I can't do that and he need to wait patiently and I'll give him a chance to cross as soon as there was some sort of gap in the masses of runners that were passing at that stage. Suddenly I just saw this guy got back into his taxi and tried to cross even though there were still many runners in the road and with no apparent gap. I shouted at him to stop and also at the runners to be careful as this guy is an idiot and they just need to watch out for their own safety as he totally ignored me upon crossing. Some of the runners got very cross at him and even hit his taxi with their hands. Luckily the taxi crossed successfully without anyone getting hurt, other than just getting cross at him for his stupidity trying to cross a busy intersection full of runners and totally ignoring instructions from a race marshal (myself). Once he crossed, he stopped and got out and then I got really scared as I thought he is going to do something to me or to someone else. He just got out and checked if he had any damage to his vehicle and drove off again. During the rest of the run it went better but there were still some people that was really impatient and one lady even complained as to why we didn't put up notices of the road closures and how she had to drive around for half an hour trying to find a route out and swearing at the whole situation and I was just trying to calm her down and told her to be patient and that I will give her a gap as soon as there was a gap in the stream of runners passing the intersection. 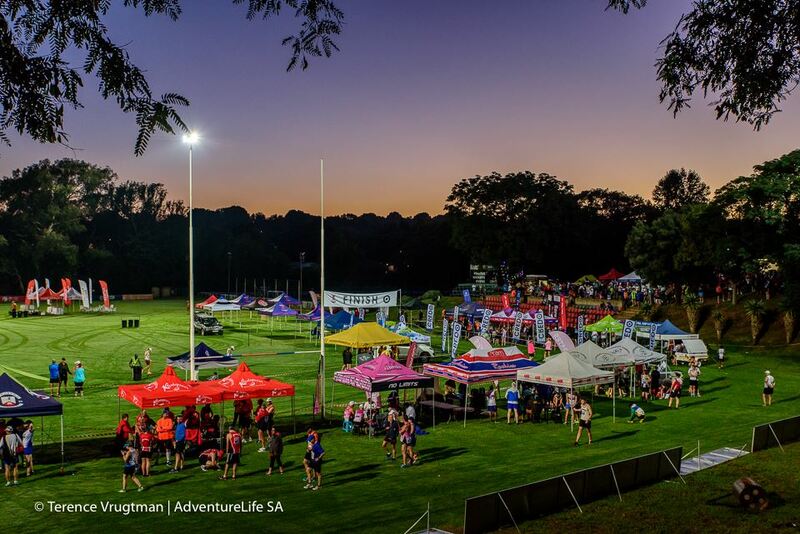 On a side note, we did publish an article in the local newspaper so people can be aware of this race and be prepared for the road closure that night. Upon finishing my duty about 3 hours later after the last runner has passed, it felt like I needed a strong drink to calm my nerves. And I thought to myself I am really not going to get myself being talked into marshalling again very soon as this was really a stressful evening for me. 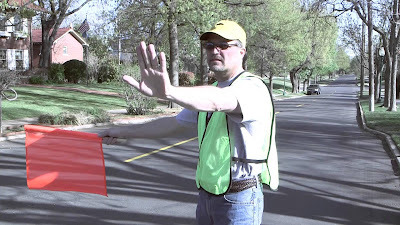 I got new respect for all the marshals that are always assisting at various intersections during a race and I will really make a point out of it to thank each and every marshal on route during my next race for their time and effort and the work that they are doing for the love of the sport. Have you ever marshalled? Have you had a bad experience with impatient people? Please feel free to let me know in the comments section below. I have decided to start my own running blog after I was featured on Megan's Getfithappy blog this week. I really enjoyed taking part in the questionnaire she sent me to complete and I realised that I have a love for writing and as my wife said, I am better at writing to say what I want, rather than talking about something. Today is not a Monday or a first day of the week or the first day of the month to start off with my blog, in fact it is a Friday in the middle of February. If you want to start with something, why must you always wait for a new week, month or even new year to start with your new resolutions? This blog will be about my love for running and will feature (amongst others) posts on running in general, races, sport nutrition, coaching, tips, reviews and generally anything running related. As my blog progress I will add different pages for the different sections. I am currently training with a running coach according to a structured training programme and my goal at this moment is to run anything further than a half marathon and my first goal is a 32km race at the beginning of March this year. I also want to run a marathon and the coach has scheduled it for the first weekend in April, but I will have to see if my training allows me to do it. I will post more about this later on. I am also a Strava addict and when I'm done with a run I can't wait to get back to my phone to upload my workout and to wait for the Kudo's. If you're part of the Strava community you will know what I'm talking about. In fact, before I posted anything on this new blog, I already had my Strava widget setup which links to my daily workouts on the right hand side of the page as you will see. Please feel free to follow me on Strava. I live in Roodepoort which is a suburb of Johannesburg and I am part of Randburg Harriers running club. Tonight is our annual Valentines night race and I will be assisting at the start and the finish of the race. I will take some pictures and do a blog post about this race in the near future as well. I also have a 10km tempo run scheduled for Saturday and an 18km long run scheduled for Sunday. This means busy weekend ahead in terms of training. I am also looking forward to our Saturday braai at one of our friend's house. If you read this, please leave a comment and please follow my blog for updates. Also, please advise on any widgets I need to add or any other tips and tricks for blogging would be appreciated.